Tesla said the crossover will come standard with falcon wing doors and all-wheel drive. Tesla Motors will begin prototype production of the Model X this fall, and vehicle production for reservation holders is set for early 2015, a company spokeswoman said. In an e-mail to reservation holders sent on Monday, Tesla said the crossover will come standard with falcon wing doors and all-wheel drive. Third-row seating will be optional. Pricing for the base model or the third-row option was not available. “We’ll also deliver a level of functionality and practicality that will exceed what you saw on the concept vehicle,” the e-mail read. Tesla unveiled its third vehicle in February 2012, and had planned to begin deliveries in 2014. According to an SEC filing in March 2013, Model X production was pushed back to late 2014. The filing also said Tesla plans to produce about 10,000 to 15,000 crossovers per year. 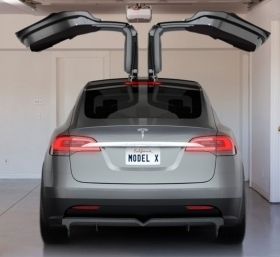 Customers can reserve a Model X on the company’s Web site with deposits starting at $5,000. Tesla spokeswoman Liz Jarvis-Shean declined to comment on how many deposits have been made. The e-mail said more updates on the Model X rollout will be available in the coming months.